- Better deal for first time?! Win set of Mevius Weapon with "[Bonus Stage] Mevius Weapon Awake Set", now on sale! - Earth Only! Equipment of 11 stars Lv100 limit in the winning line-up of "Authentic-Astra Arms Festival" are available by element for 1 day only! - Go beyond Max Boost, and go for more power! "Mevius Arms God Fest" now available! - SP offer! [All] avatars will become Shining or Costume from purchase of "Spin x10" of "Butler Avatar"!​Better deal for first time?! Win set of Mevius Weapon with "[Bonus Stage] Mevius Weapon Awake Set", now on sale! "Mevius Weapon Awake Set" with Mevius Weapon and 'awake' item bundled in a set is on sale! Step UP campaign now starts where becomes more reasonable for according to number of purchase, Awake Crystal comes as bonus after 3rd time! Try awaking your weapon in this opportunity! --Win 2 of 1 of these types! * Can be purchased 5 times for each account. * The counts for the spin times will reset from this campaign. * The won Weapons have equip level limits. *The offerings ratio is showing rounded off minor 4th place, that there is possibility that the total value will not be 100%. ※The offerings ratio is showing rounded off minor 4th place, that there is possibility that the total value will not be 100%. Earth Only! Equipment of 11 stars Lv100 limit in the winning line-up of "Authentic-Astra Arms Festival" are available by element for 1 day only! Introducing the 1 day limited pack that gathers all the "Earth" only Astra Arms together! With a lineup of 11 stars or more Lv100 limit equipment, this is a pack that makes it easy to aim for Astra arms with specific elements. Additionally, we are starting the campaign ''Stone Big Box 10'' for when you use ''Spin x 10''! So pick your element of choice, and let's waste all opponents! 6 Gems per "Spin x1"
* Arms within the Pack have equip level limit set. * Purchasing "Spin x1" ten times does not apply for the offer. * "Add element" at "Expert Blacksmith" is not available for Astra Arms. Go beyond Max Boost, and go for more power! "Mevius Arms God Fest" now available! "Mevius Arms God Fest" now available! 11 and above are confirmed to win, and as equip level-limits are higher, the stronger the arm! 5 Gems per "Spin x1"
50 Gems per "Spin x10"
*Armors within the Pack have equip level limit set. SP offer! 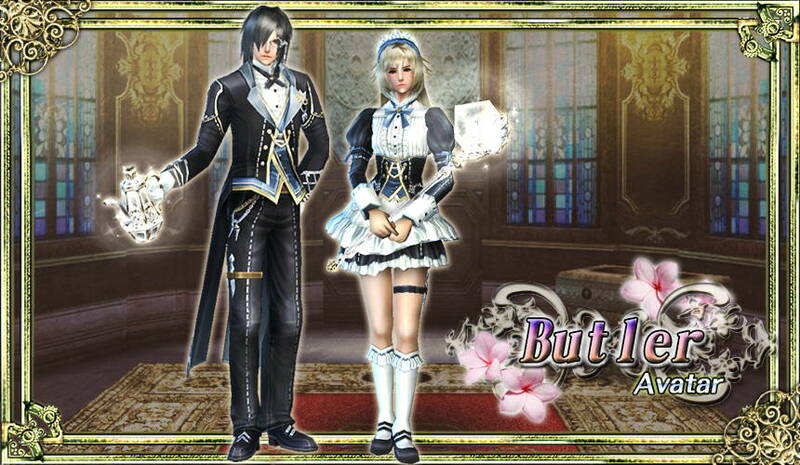 [All] avatars will become Shining or Costume from purchase of "Spin x10" of "Butler Avatar"! Special Offer! All avatars won from “Spin x10” of "Butler Avatar" is Shining Avatars and costume avatars! No regular weapon avatars! Shining arms avatar, shining accessory avatar or costume avatar will be randomly won! * Guaranteed ''Costume Avatar'' is one from Upper, Lower or Head Avatars within the lineups. * Purchasing ''Spin x1'' ten times does not apply for the offer. *"Spin x10" will increase the chance to win the product than of "Spin x1". Due to this, the product coming out of the pack will be confirmed from "Spin x10".